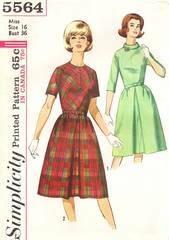 Uncut vintage sewing pattern from 1964. Dress has gathered skirt with inverted pleats at center front and back. Kimono sleeves may be short or below elbow length. Jewel neckline with optional bias roll collar. Back zipper closing. Pattern is complete and in original factory folds. Envelope and contents are in very good condition.